Anthony Milewski, CEO of Cobalt 27 Capital, shares his thoughts on electric cars and the cobalt market in this PDAC 2018 interview. The Investing News Network caught up with Anthony Milewski, CEO of Cobalt 27 Capital (TSXV:KBLT), at this year’s Prospectors & Developers Association of Canada (PDAC) convention to get more insight on the cobalt market. 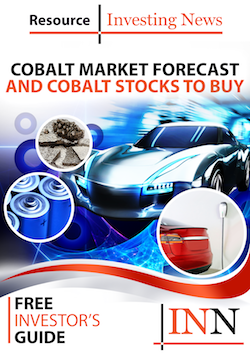 Milewski said it is a very important time for the cobalt market because “we are seeing a structural change” in the energy and automobile markets. Today, the cobalt market is 100,000 MT, but as demand for electric cars and adoption rates surge, cobalt demand will also increase. He also shared his thoughts on long-term cobalt supply deals and why they are important for the market. “In my view, every single consumer of cobalt is out speaking with probably every single producer of cobalt,” he said. Milewski talked about Cobalt 27’s recent deal with RNC (TSX:RNX) and about how his company is different than other cobalt-focused firms. You can see our video with RNC’s Mark Selby here. Watch the video above for more of Milewski’s thoughts on electric cars, cobalt prices and what’s ahead for his company in 2018. And don’t forget to check out our other PDAC 2018 videos.